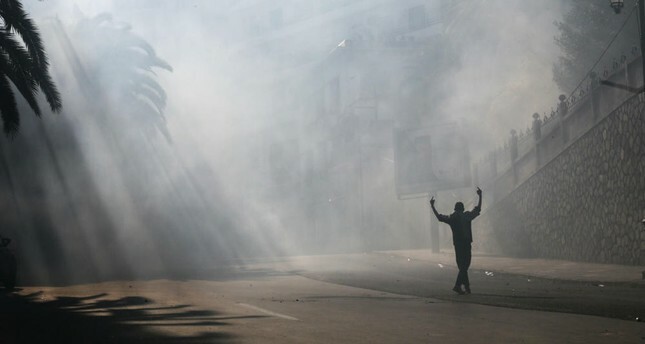 A protester gestures during clashes with police officers at a demonstration against the country's leadership, in Algiers, Friday, April 12, 2019. The Algerians have not surrendered and have consistently refused to use violence; they have powerfully and staunchly voiced their refusal to be taken for idiots by allowing a fifth term for President Abdelaziz Bouteflika and are on the verge of rejecting the opaque regime ruling Algeria. Due to the insistence and magnitude of peaceful protests in Algeria, the armed forces have demonstrated flexibility by declaring that they were proud of the Algerian people, then in a second move, they asked Bouteflika to step down. The high command of the army is made up of people very loyal to former President Bouteflika. However, in this case, the dignitaries of the regime in place had no choice but to give in to some of the basic demands of the population. The trouble is that nobody within the regime has any idea on how a transition can take place within the constitutional framework of Algeria. Although there has been an incredible spontaneous organization of civil society, where schoolteachers and university lecturers have organized debates on the constitution, but which nobody has taken the time to read, that can give hints on how to find a peaceful transition to pluralistic democracy. The army had so far remained unwilling to intervene in the ongoing protests. Now that the president of the Council of the Nation, Abdelkader Bensalah, is endorsing the interim presidency, new elections are to be held. Nobody wants to see Bensalah, an obscure dignitary of the regime loyal to Bouteflika, remain in the presidency for long either. So what will the army do? Again, this is the real question that needs an answer. Up until now, the high command has been cautious not to threaten the popular movement. However, is their patience wearing thin? Another essential question is also whether the army is willing, united and strong enough to dominate this political situation. That brings us to another peaceful popular movement. Sudan's long-reigning master Omar al-Bashir has been removed from office by the armed forces. For weeks, Khartoum's population has been protesting al-Bashir's rule, without the armed forces stepping in. The police have been trying to contain, in vain, the protests in the streets. The Sudanese regime is not known for showing leniency toward popular and democratic protests. Nevertheless, this time the army remained neutral vis-a-vis opposition protests. Then all of a sudden, a conventional military coup that looked like a palace coup happened. This was not at all to the liking of the Sudanese people who were asking for more democracy. The new junta called for a two-year military governance period and established a night curfew. Up until then, it seemed like nothing surprising, just another military takeover disdainful of democratic demands. However, this time the population did not go back home and continued to protest, very much like in Algeria. That was unexpected, and the military junta, who initially thought it would be business as usual, was deeply shaken. Less than 48 hours after the coup, the general, who seemed like the leader of the junta, resigned. More strikingly, another member of the junta, the all-powerful head of the intelligence service and one of the most feared personalities of the regime, Salah Abdallah Gosh, also resigned. The chief of the restructured junta made a solemn appeal to the civilian political parties to come together and offer the junta a civilian solution, meaning a civilian premier and government. The junta also announced the lifting of the curfew, giving strong signals of a peaceful transition with the support of the armed forces. Both in Algeria and in Sudan, the armed forces have shown unexpected maturity against very legitimate democratic demands by the population. Can this be considered a turning point in political history? For the time being, they remain early and limited examples for establishing new axioms. Still, the ruling elite in such countries as Algeria and Sudan seem to have understood that there is no solution to be expected from military interventions. The example of Egypt, with its betrayed democracy and revolution, remains a very powerful symbol in the eyes and minds of people asking for democracy. This is a development to follow and study very carefully.